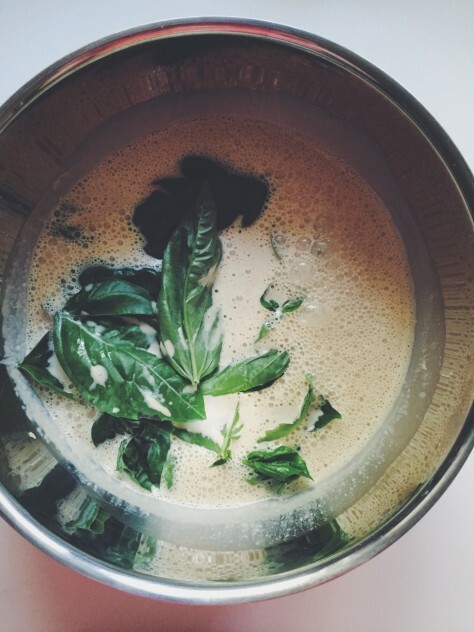 Basil and summer go together like pb&j. I’ve been putting basil in dressings + pesto + salad, but my food brain wanted more. When we were in Nashville we had a mini strawberry pie with anise ice cream at 5th and Taylor. I am typically not drawn to anise-flavored things, but that barely sweet strawberry pie with rich anise ice cream was a delight. And when I saw a recipe for basil chip ice cream in Bon Appétit, I felt like the anise-like flavors in the basil would be a similar treat. 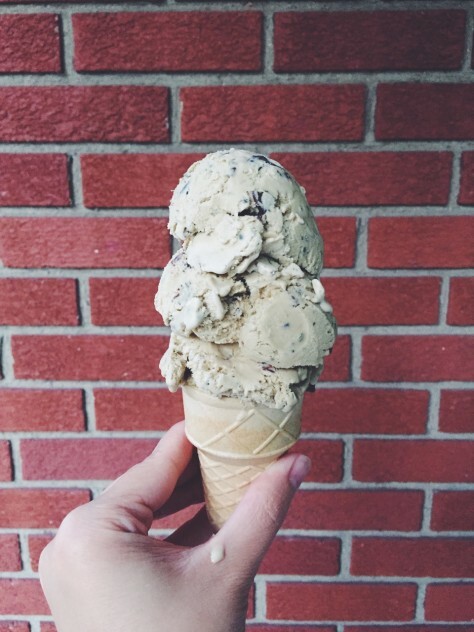 It’s creamy and sweet with the herbaceous basil and bitter dark chocolate fighting for your tastebuds’ attention. The best kind of fight. 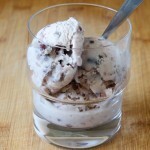 This recipe takes a few days because you cold-steep the basil ice cream base for a smoother basil flavor. I thought maybe it would be too off-the-wall for Marc, but he loved it. 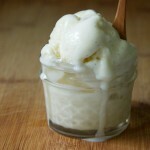 You can strain out the bits of basil from the ice cream base before churning it, but I kept it in. Those little basil bits are like nature’s sprinkles. 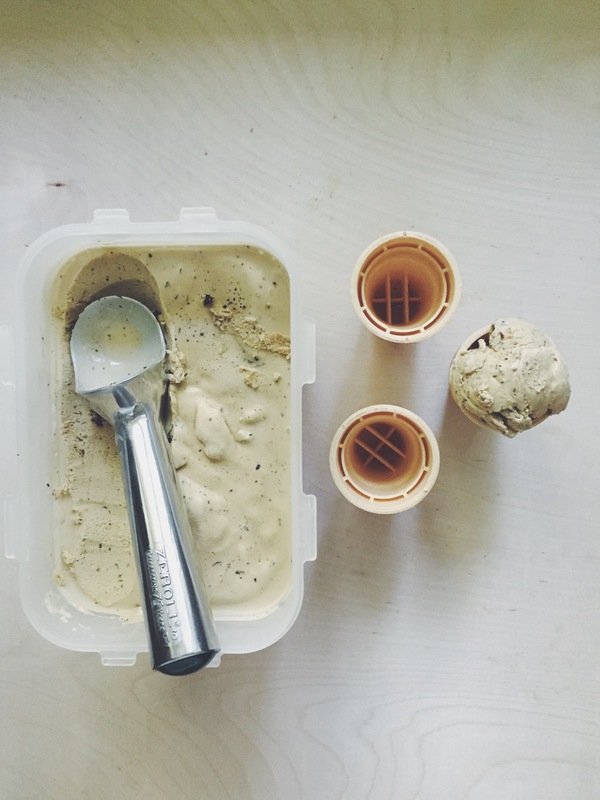 If you’re looking for a good ice cream scoop, we love our Zeroll 1016 scoop. As you hold it, the warmth from your hand heats the scoop and makes everything easier. You have to hand wash and dry it when you’re done, but its a small price to pay for perfect ice cream scooping. This post contains some Amazon affiliate links. If you purchase anything from Amazon using one of those links, it won’t cost you any more, but I’ll get a little kickback that helps me run this little blog. Thanks for supporting Dula Notes! If you’d like to use regular granulated sugar, use 1/2 cup because coconut sugar is less sweet. Also, the coconut sugar gives the ice cream a chocolate milk-type color, but using granulated sugar will result in light green ice cream. You can strain the ice cream base before adding it to your ice cream maker, but I loved the little flecks of basil in the ice cream. Prepare a large metal bowl inside another larger bowl filled with ice water. In a medium saucepan, bring cream, whole milk and sugar to a simmer over low heat. Whisk occasionally and watch carefully. In another large bowl, add egg yolks and whisk. Set aside. Once cream/milk/sugar mixture is hot and bubbles have started forming around the edges. Carefully and gradually stream half of the hot mixture into the bowl with the yolks while whisking vigorously. Pour the mixture back into the saucepan and cook over medium-high heat, stirring constantly with a wooden spoon, until the mixture coats the back of the spoon when you dip it in, about 2 minutes. Pour mixture into prepared metal bowl that is set in ice water. Stir in condensed milk and salt. Let cool, stirring occasionally, for 30 minutes. Stir in buttermilk. 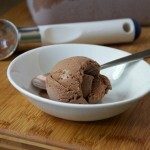 Using an immersion blender (or blend in batches) blend until base is smooth and silky. Add basil and blend until basil is finely chopped. Cover and chill for 2 days while basil cold-steeps. 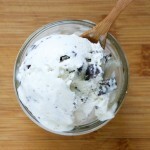 After 2 days, add mixture to ice cream maker and follow your ice cream maker’s directions. My Kitchenaid attachment took about 15 minutes. Transfer to an airtight container and stir in dark chocolate chunks. Freeze at least 2 hours before scooping. What a genius little scoop! Genius ice cream, too — I’ve never tried cold-steeping but it makes sense that it would be smoother and all-around better. Patience is such a nice trait to have in the kitchen! I love my ice cream scoop! True story: we got the recommendation from my brother-in-law’s old roommate who dated lots of ladies and was very particular about his fancy car/bike/AND ice cream scoop, ha! Sometimes having patience is so hard when you just want delicious results NOW, but cold-steeping is the way to go! YESSSS. I saw this recipe in BA and have been dreaming of it since. It looks amazing! Basil ice cream!! I remember making it in culinary school but we never added chocolate chips into the mix. Don’t know why… it makes it so much more fun and delicious!! Awesome Nicole! Thanks, Gabriel! If you really want the ice cream to be “all about the basil” then the dark chocolate probably gets in the way for some purists, but I loved it together. It can go head to head with mint chip for best summer flavor! This is so appealing to me. I hope I get around to making it. I am making this before the summer is over!!! Looks and sounds incredible. Lately I’m finding that I’m drawn to more off the wall ice cream flavours. This looks amazing! And I might have to get my hands on one of those ice cream scoops! Oooh. I think cold steeping the basil is a really smart idea, Nicole! I’ve made a basil-y ice cream before, but steeped it warm. I bet doing it cold keeps that flavor so fresh. Also, I’m admiring your chocolate fleck game. They look perfect! Aw, thanks Autumn! The basil flavor does stay fresh and really “green” tasting! Chopped chocolate chunks are the beeeest!